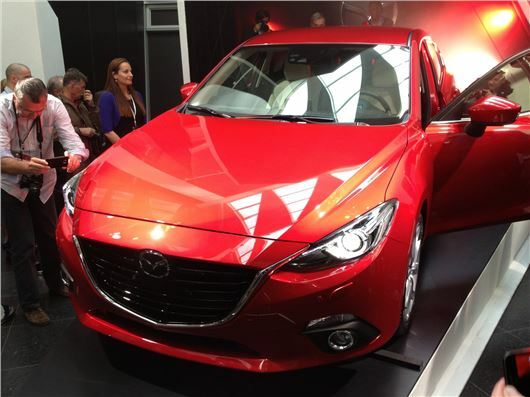 Unlike its predecessor, the new Mazda 3 will not be mistaken for a Megane or an Astra. It sets the pace as the most distinctively styled car in its class. Simultaneously launched in New York, St Petersburg, Istanbul, Melbourne, Cologne and London at 15.45 London time, it concentrates the 'Kodo' design of the Mazda CX-5 and Mazda 6 into a family hatchback. In the (translated) words of designer Koji Tabata, its muscular profile conveys "accelerating motion; condensed energy; like a well traned athlete." Under the bonnet are a new 100PS 1.5 litre Skyactiv petrol engine or the familiar Skyactiv 2.0 165PS petrol and 2.2 litre 150PS diesel. These are supplemented by a 120PS 2.0 littre petrol engine, and all the larger engines will be available with 6-speed manual transmissions or 6-speed automatics. Inside, technology abounds with head-up and TFT displays, but, happily, a conventional lever-type parking brake. Other advanced features include "i-Activsense" radar cruise control. No performace or economy figures have yet been released, but expect at least 60mpg in the EC drive cycle for the 2.2 Skyactiv 150D, and emissions of less than 110g/km. The new, third generation Mazda 3 goes on sale in the UK at the end of 2013. We'll be bringing you more information and a test drive of prototype cars next week. Full details of the spec in Mazda 3 2014 car by car entry here.